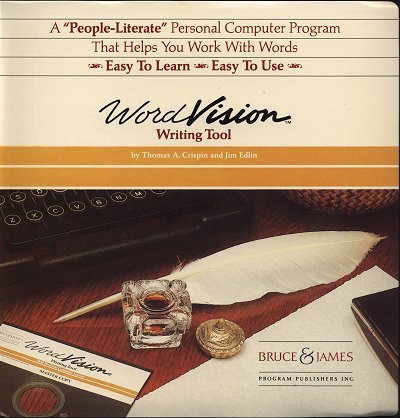 WordVision, released in 1983 and reportedly inspired by the Compucolor II Compuwrite, was a word processor for the PC that in some ways was ahead of its time. It was written by Jim Edlin (no relation to MS-DOS Edlin :P ) and Thomas A. Crispin of Bruce & James Program Publishers Inc. The product focused on ease of use, yet provided many advanced features. All of this while targeting a low retail price ($50-$75). It had several interesting aesthetic features as well. The installation disk was self booting: You booted from it to create working copies. The typical error beep was also replaced with a more pleasing "chime" sound while the program operated. 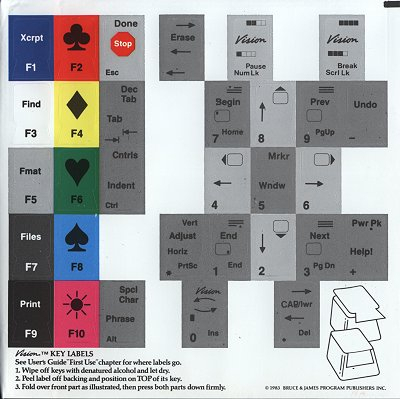 The software includes symbolic key labels for common function keys, and always shows on-screen labels for those that change. Compared to other IBM PC software of the time, the program is very fast and responsive. It does do a few things that might seem odd today. It attempts to be "modeless", always using an "insert" mode. The text workspace is called a "scroll". It is somewhat customizable "for different work habits". In other words it can behave more like a DOS text editor. The program required an IBM PC or compatible, 96K RAM, 80 column display, 1 disk drive, PC-DOS 1.0 or 1.1, and a printer. "Microcomputer software is in the midst of taking a major step forward. 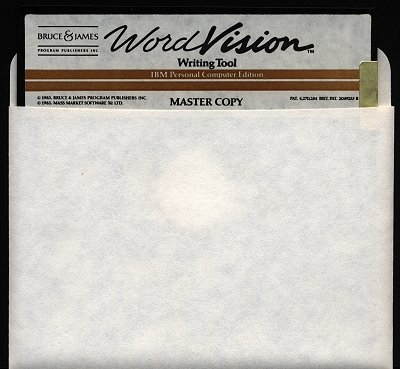 Three new products are responsible: VisiCorp's VisiOn, Apple's Lisa, and Bruce & James' Wordvision." This seems like a bit of an overstatement to me. While it does focus on general user friendliness, it does not support mice, and it does not have a fully on-screen navigation menu. As such, navigating may be very confusing if you do not have the special key labels on your keyboard. It is also not an application environment or even an integrated office suite - it is just a word processor. 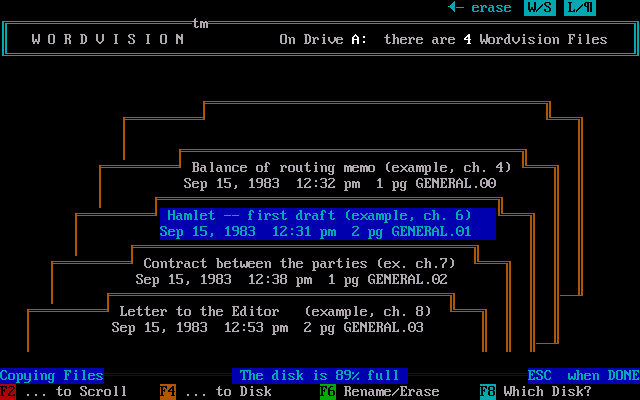 Nevertheless, most word processors in 1983 had hodge-podge user interfaces that reflected what programmers thought a word processor should work like, that intentionally mimicked earlier confusing dedicated word processing hardware, or cut UI corners to fit features in to constrained hardware. Another interesting thing about WordVision was how they tested it. Prior to release, they ran a "pioneers club" to help perform what they called "gamma testing". This "pioneers club" consisted of about 900 people, many more than had participated in initial beta testing. Instead of just reporting things that did not work to spec, they reported their experiences using the software and suggested improvements. The final release included a number of features suggested by these "pioneers." Essentially, this extra step ensured that the program not only WORKED but also WORKED WELL. This is a step that is completely non existent in modern software design. Separate "powerpack" packages were sold that would add extra optional features to the base software package. This archive does not include any power packs. 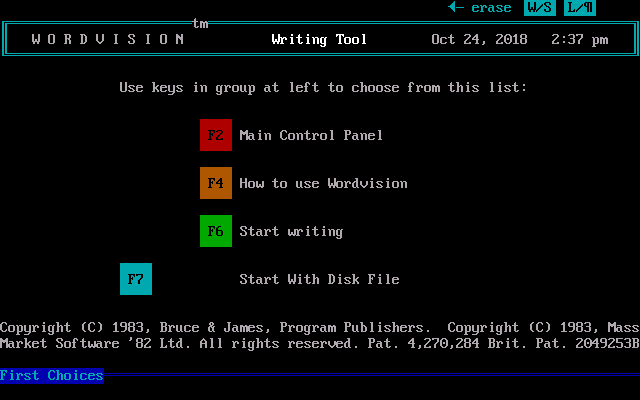 Notably, unlike most software, WordVision was sold through book stores instead of computer stores. This, and by offering no direct user technical support, kept costs low. However their choice to sell through book stores turned in to a disaster. They were shafted by their distributor and the company went broke. This archive was produced in cooperation with the designer, Jim Edlin, and came from original materials he provided. The effort to get it archived was spearheaded by Trixer of the VCFED forums. Hats off there. It is awesome to see people reach out to authors and succeed in getting vintage material preserved. I'm afraid that personally it is not in my nature to bug people, but that is something more people should do. Well, one can search the WinworldPC library for the keyword "wanted". Although there are many smaller titles that are not here at all, and I may not even be aware existed. I used to have a "wanted" forum thread with items listed from magazines. But the Seen on eBay threads seem more productive as all one has to do is throw 20-30 dollars at a title and get it archived. My personal favorite, in case my avatar does not give it away, is VisiCorp Visi On. Chances are the Unix based development environment and later corporate-only releases have been lost to time. Some former developer could have a copy, but I don't have the energy or will to pester people about it.